The first certification for TROX was performed by KWU (Kraftwerk Union AG) Erlangen/Offenbach on the basis of QSP 4a in 1982; in the years that followed, certifications according to KTA 1401 and DIN ISO 9001 were also performed. In the meantime, NIS Ingenieurgesellschaft mbH performs this certification on the commission of power plant operator KWU. 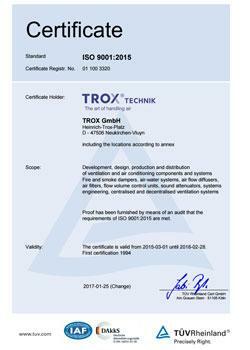 Since 1994, TROX has been certified by TÜV Rheinland according to DIN ISO 9001/EN 29001. In the beginning of 2003, there was a changeover to ISO 9001:2000. This required an adaptation of our quality management manual and some of the process instructions. In 2009, the switch to ISO 9001:2008 took place. In january 2017 TROX has switched to the new ISO 9001:20115. Safety-relevant components are subject to external monitoring by the Forschungs- und Materialprüfungsanstalt für das Bauwesen (FMPA) (Research and Material Testing Institute for Construction). The quality management area of activities is directly subject to the Board of Management, thereby ensuring its independence. Quality assurance is organised in a decentralised manner and lies in the responsibility of the respective factories. In production, the worker self-test has been introduced.